The obvious challenge, for data laden organizations, is how to use data effectively and efficiently to learn, explore and discover. Until now, teams have asked questions and hoped that answers were buried somewhere in their data. What would happen, however, if your data could instead tell you which questions to ask by showing you correlations, anomalies and opportunities at nearly a glance? Clinical researcher Kris Schulz of Duke University Health System knows the answer. Working with CHEER (Creating Healthcare Excellence through Education and Research), an NIH-funded practice-based research network in otolaryngology-head and neck surgery, Kris and her network team ran an unprecedented analysis of tonsillectomy bleed rates. Kris first ran a traditional analysis of the tonsillectomy data. Then, she asked what more she could find if she could see her data differently, in ways that she could never see it before. "We are looking, specifically, for anomalies," says Schulz. "We want to glean more insight from the mass quantities of data that we receive and make sure that we don't miss anything." Now that data integration and hygiene processes are standardized and automated, organizations find themselves with a vast array of useful data but lack the functionality to see that data in more useful, comprehensive, contexts. SynGlyphX data visualization and insight discovery software changes all of that. SynGlyphX provides software and solutions that allow teams, like Kris’, to visualize and interact thoroughly with their complex data – all in a single, 3D, environment. "We are astounded by the value of SynGlyphX," says Schulz. "We visualized a raw dataset in SynGlyphX and we were amazed that, without a stats package, the findings in SynGlyphX were the same as those identified when doing a multitude of statistical analysis." 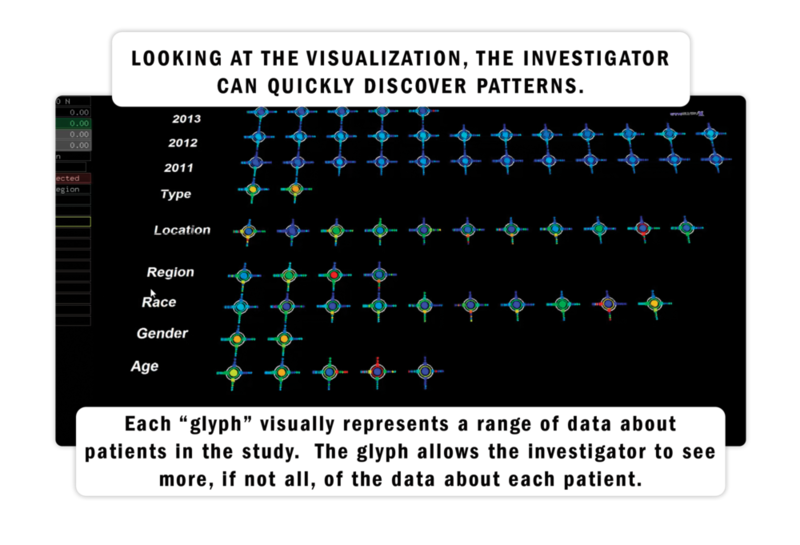 Visualization within SynGlyphX’s GlyphViewer™ led Kris and her team to additional, unexpected, discoveries: discoveries that will create notable improvements for tonsillectomy patients. "When we saw our data visualized in GlyphViewer™, we immediately found things that we didn't initially explore," says Schulz. "We saw, very clearly, that those with Hispanic ethnicity had a bleed rate that was 3 times higher than those of non-Hispanic ethnicity." Ethnicity had not been included in the research plan, because the existing process required that questions were determined prior to data analysis. "Because of the way that SynGlyphX displays information, you have the temporality, the event and the anomaly, so you can zone right in on patient results and look for patterns in their treatments. We could see variances in the data very easily." Schulz sees SynGlyphX software as an integral tool for reshaping and improving the overall research and communication process for datasets collected and utilized by the CHEER practice-based research network. 3) More efficiently and effectively communicate findings to researchers and patients," says Schulz. Beginning with SynGlyphX data visualizations will enable the team to include all possible opportunities for exploration. "With SynGlyphX, we can load the data and see the anomalies and immediately identify the areas in which we should focus our research," says Schulz. "This changes the way that we will perform and present research in the future. Now, we will analyze our datasets in SynGlyphX first, and let the data tell us what to explore." SynGlyphX provides value throughout all stages of research. "SynGlyphX is also very helpful in getting your message across," say Schulz, who presents information to scientists, doctors and patients. "When presenting data to peers, we noticed that surgeons, doctors, clinicians and scientists were much more engaged. We presented our findings at 6:00 am on the 3rd day of a conference. People had already absorbed a lot of information. When data was presented within SynGlyphX, you would see people perk up. They stopped looking at their phones and became very engaged in our presentation." Educating patients has also been a success. "Patients understand the information that is presented to them much more quickly, says Schulz. "We have a four-minute video that shows, very clearly, the findings of our research. Now patients know everything they would know if they had read our 12-page research paper." "THEY STOPPED LOOKING AT THEIR PHONES AND BECAME VERY ENGAGED IN OUR PRESENTATION"